From May 21-26, 2012, the 65th World Health Assembly met in Geneva, Switzerland, to resolve how to improve world public health. They re-elected Dr. Margaret Chan for a second five year term as Director General of WHO, World Health Organization. Mental Health, vaccinations, maternal and child nutrition and financing for implementing resolutions and several other public health issues were discussed over plenary sessions. You may click here for details of sessions and resolutions. We shall update you here as the financing decisions of the resolutions are announced. Hopefully, we shall update you after the meeting in Rio coming up. 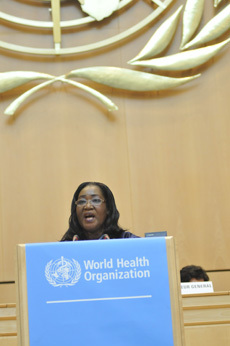 Professor Thérèse N’Dri-Yoman, President of the Sixty-fifth World Health Assembly, addresses the delegates at the plenary session. The Health Assembly unanimously adopted the resolution on the Consultative Expert Working Group on Research and Development: Financing and Coordination in the form presented as draft by the drafting group and circulated yesterday. To continue reading resolutions for each day from May 21-26, 2012, click here.